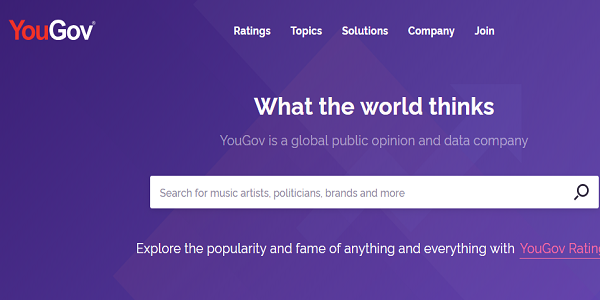 YouGov Review: What is YouGov? Is YouGov Scam? Earning money online has become a trend these days. Everyone is in a rush that they will be able to earn money by working over the web. And one of the parts of online earning is a survey site. You are definitely here to clear all the questions intriguing in your mind like Is YouGov scam or legit? Does it really pay? Here in this article will be covering all the questions which will help you to determine whether you should work on this or you should stay away. YouGov is doing its working since 2000 and is one of the reputable companies. The website has a good backbone as all the users have reviewed that they were paid. Basically, YouGov is an online market research that brags that they provide the shelter to the opinions and ideas of many people who want share their views about the affairs going on in the world. YouGov has it’s headquarter in UK but its working is also available in many other countries. YouGov is an opportunity that helps you to earn some extra cash just for providing your opinions and views. Different countries have different domain name like if you live in US then you can sign up using YouGov.com and if you live in UK then you can sign up using YouGov.co.uk. As soon as you join you will get 2000 as bonus points. YouGov app is available for both IOS and Android. You can earn points by completing surveys. Doing surveys are pretty fun and interesting to do. You can expect to get around 5 to 7 surveys a week. Approximately, you will get 500 points to 1400 points. Thus, roughly 1400 points is equal to $1. You will even get invitations for high paid surveys which will definitely increase your earnings. The surveys are usually 5 to 10 minutes long but the surveys which take nearly 25 minutes of your time will pay you much higher. Whenever there will be survey which will fit your demographic profile, YouGov will send you an invitation through email. The best way to earn money on such sites is by referring friends. And fortunately, YouGov does pay you to refer friends. So once your referred friend joins using your referral link and completes 3 surveys, you will get around $3. Except surveys and referral program YouGov also provides you other opportunities in which you can earn money like testing products, political surveys, economic surveys, celebrity surveys, reading articles, etc. In order to earn you firstly need to complete your complete your profile in which you need add the details about yourself. And after you fill the details YouGov will send you invitees via email of surveys which match your demographic profile. For example, they may ask you a question like are you employed, unemployed, retired. Suppose, if you chose the retire option then you will receive survey about that. You are highly suggested that you should always be honest and true with the answers you provide. Because once they catchy you lying then will ban you and even will stop sending you surveys. How does YouGov pay you? In YouGov you will be earning in points. In order to withdraw your points you will have to accumulate 25000 points. In case if you live in UK then you have to wait until and unless you collect £50 which means that it will take a lot of time. You can redeem your points into cash via PayPal. You can even opt for Gift cards like ITunes, Best Buy, Walmart, Amazon, etc. You can even donate your points. Basically, it takes up to 5 to 10 business days to reach your payment if you chose PayPal as an option. But gift cards will take 3 weeks because they are sent at your address. Many members are complaining about not receiving enough surveys. And most of complains are have come from the members who are located outside USA and UK. The pay that members get for surveys are very less. The minimum cash out limit is very high that is 25000 points and reaching to that threshold will take much long time. Members even complained that most of the times they get disqualified after vesting 5 to 8 minutes in a survey. Is YouGov scam or legit? YouGov is a reputable survey site which pays in real. If you want to experience something new and you are updated with the current events going over the world then site is for you. YouGov is 100% legit site and you can earn some extra cash by using it. Yes we do recommend YouGov and we list it under our “Promising Section”. But by just working on this site online won’t fetch you much. If your mind is restless because of some doubts then please feel free to comment in our “Comment Section”. We would be delightful to help you.